An All Electronic Tolling (AET) gantry on the Mass Pike in Newton. 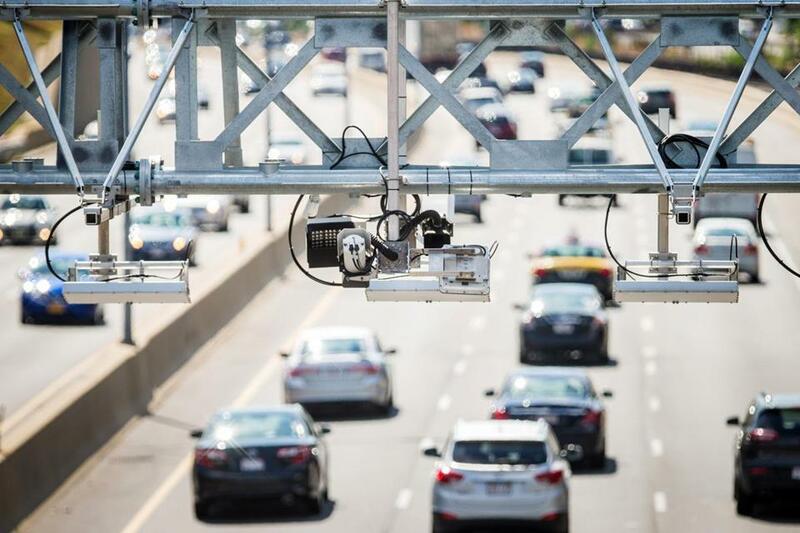 In the year and a half since Massachusetts went to all-electronic tolling, some 1.3 million cars have gotten a free ride because the new system couldn’t read their license plates. The new system fails to read about 2 percent of license plates, which is a much lower rate of missed tolls than other highways, and well below the losses Massachusetts officials originally expected when they rolled out electronic tolling in October 2016; at the time they forecast problems capturing about 5 to 7 percent of license plate images. About 85,000 trips a month on the Massachusetts Turnpike, Tobin Bridge, and harbor tunnels are written off because of poor license plate images. With the average toll at $1.47, that amounts to about $2 million in lost revenue through February 2018, the most recent data provided by the state. The electronic system records about 21.5 million toll trips on average every month, with most of those paid through an EZ Pass transponder linked to a credit card or bank account. About 4 million of those each month do not have transponders. Instead, the state reads their license plates by video camera, then bills the owners by mail. In a small percent of cases, the license plate reader cannot get a good image because the cameras are poorly positioned, for example, or plates have faded or are blocked by a bike rack. Officials said they are trying to lower the rate of uncollected tolls by using other tactics to find addresses, such as identifying company logos on the sides of commercial vehicles. The broadest strategy is to continue pushing drivers to use EZ Passes, which now account for almost 87 percent of all toll payments. Governments around the world have struggled with poor license plate images as they transition to pay-by-plate systems, said Bill Cramer, spokesman for the International Bridge, Tunnel and Turnpike Association, a trade group that includes public agencies and private companies. In Massachusetts, officials said a small number of the uncollected tolls are due to drivers intentionally covering their plates. The state’s transportation department says the switch to electronic tolling has lived up to another billing: $5 million in savings every year by no longer having to maintain toll plazas. Moreover, overall toll collection, at around $30 million a month, is roughly on par with revenues under the old system. Meanwhile, out-of-state drivers owe about $7.2 million. The state has agreements with New Hampshire, and Maine, where motorists there must pay outstanding Massachusetts tolls to renew a registration, and is close to a similar deal with New York, Collins said. But that’s just a handful of states, and officials have said they plan to hire a debt collector to aggressively chase unpaid tolls from other jurisdictions. Other tolls go uncollected because the state cannot match a license plate with an address. Collins said the state regularly follows up with motor vehicle departments to find addresses and may ultimately be able to bill those drivers, but it’s less certain if these tolls will be collected. Chris Dempsey, director of the nonprofit group Transportation for Massachusetts, noted drivers have benefited from the new system because all-electronic tolling has eliminated backups at former toll booth sites.